Dr Teena Thomas did her graduation from GandhiMedical College, Bhopal;followed by her MRCOG training from CSI Hospital Bangalore from 2002 to 2006.She finished her postgraduate diploma in family medicine from CMC Vellore.She has Wide experience in obstetrics and deals with all HIGH RISK PREGNANCIES and has conducted more than 2000 deliveries.She has 4 to 5 years experience in gynaecology,when she worked with HCG group.She deals with all teenage problems including pcos and has expertize in all gynaec disorders and surgeries; and with good bedside skills. Mrs. Shymala Usha – Brookefield, Bangalore. The rooms, washrooms, meals and overall service are purely brilliant at Apollo Cradle and beyond any hospital, I have known or come across. I was under the care of Dr Teena Thomas. The service provided by the hospital is of unmatched quality. Dr Teena is highly educated and trained in her field. She is reliable and trustworthy. The nurses are excellent and are always there to help and guide throughout. The entire staff is caring and considerate at all levels. I was given the best possible care at Apollo Cradle. The rooms and facilities are also outstanding, you are treated to absolute comfort. I was under the care of Dr Teena Thomas, who is extremely kind. The surroundings were positive and the nurses were friendly and pleasant. The administration was smooth and there were no delays in the procedures either. Mrs.Sasmita Kumari – Brookefield, Bangalore. Apollo Cradle showed professionalism and teamwork. I was under the care of Dr Teena Thomas from the department of gynaecology and obstetrics; she is kind, helpful, and understanding. She is skilled and helped me understand everything completely. The staff is diligent, agile, and dedicated to providing quality healthcare. The food was hygienic and the administration is well run. The entire team at Apollo Cradle is highly skilled. Their level of care is beyond what you imagine or expect. I was under the care of Dr Teena Thomas. The team is constantly striving to provide maximum quality to everyone. The team is always on their toes, friendly, and polite as well. Dr Thomas is highly qualified and experienced. I honestly believe the compassion and warmth of the Apollo Cradle is what separates it from other hospitals. Mrs.Vinaya Prasad – Brookefield, Bangalore. Apollo proved to be a good choice for us. The dedication, experience and compassion of the Apollo Cradle is exceptional. There was almost no waiting and the procedures were seamless. Dr Teena Thomas is kind, helpful, and empathetic. She understood my needs and supported me. She guided me professionally and was highly experienced in her field. I felt safe and trusted her throughout. I had a great experience with Dr Teena and her team. Mrs.Bhavya Shree – Brookefield, Bangalore. I cannot say enough how fantastic services of Apollo Cradle are. I was under Dr Teena Thomas’s care in the Apollo Cradle for a procedure. My experience was great. The food was hygienic and healthy as well. The room was comfortable and had all required amenities and it was kept very clean as well. The support and administration staff is nice and helpful. The team is kind and responsive. My experience at Apollo Cradle was amazing. I was under the care of Dr Teena Thomas for a procedure. I was always catered to and all my needs and requirements were met timely. They had prompt service and were very approachable. The nurses were extremely caring, empathetic, and well behaved. The room was hygienic and had all amenities. We did not have to wait much and the team was well behaved and professional. Thanks, Apollo. It has been evident through my whole experience that Apollo Cradle is an amazing healthcare facility. I was under the care of Dr Teena Thomas. The nurses are very kind and helpful as well. They are trained and articulate. The support staff is well-behaved and all procedures are timely. The best thing about Apollo is that the entire team is striving towards delivering high value. I am very satisfied with their services. My experience at Apollo Cradle was great. I was under the observation of Dr Teena Thomas, who was very helpful. The support staff was effective and quick. The admission did not take much time and the team was very responsive. The room was maintained and hygienic and was kept clean at all times. The quality of the services provided is highly and extremely satisfying. I did not face any problem whatsoever. Thank you, team Apollo. We got to know about the Apollo Cradle, Indiranagar through advertisements. While I was admitted there in April, I had a mixed experience. Dr Teena Thomas is very attentive and dedicated while nurses did a good job and took great care. But housekeeping staff is not that good. They did not provide water bottles unless asked. The food was also very spicy. However, I will recommend this since they have the best doctors and treatments. I was admitted under the care of Dr Teena Thomas at the Apollo Cradle, Marathahalli. The PRO explained the packages and we opted for the Luxury Signature Suite. They provide excellent services. The staff is very helpful and take care of you right from admission to the time you are discharged. They should also provide numbers in the room like canteen or someone in charge. Otherwise, they have done a commendable job. Thank you for this experience. I was admitted for observation at the Apollo Cradle, Brookefield clinic under Dr Teena Thomas’s supervision. The front office is easy to communicate. The doctors are highly qualified and provide great health care. The nurses are cooperative and make sure you are comfortable and respond to your concerns. The food available is healthy and nutritious. All the services are of best quality. Thank you, Apollo Cradle. Through an advertisement, I got to know about the Apollo Cradle, Brookefield. I was admitted there for observation under Dr Teena Thomas. I did not have the best experience with the nurses as they are not much responsive. The team who admitted me was good and doctors were knowledgeable and approachable. The food I received, rice was not cooked properly. I think they can improve on cleanliness a bit. Rest is fine. I was admitted to Apollo Cradle, Whitefield. The PRO helped us choose the best package and the front office team admitted on time. Dr Teena Thomas is very generous and addressed all our concerns. The nurses were well behaved and competent. The infrastructure of the critical units was great. Housekeeping, canteen, rooms etc. were very good. I was discharged right on time. I am happy with the services. The mommy make-over and photo sessions were well organized and fun, and it was a well deserved treat for the moms. Thank you so much to the management of Apollo Cradle for organizing this for us. The service in Apollo Cradle was absolutely excellent. The doctors and nurses are very cooperative. Thank you Dr. Teena Thomas for being a good support to us. I’m well satisfied with the service and will recommend my friends and family to consult in this hospital. Excellent doctors, great nurses and overall, good service. Thank you to everyone at Apollo Cradle for taking good care of me and my new-born. Special thanks to Dr. Teena Thomas for her care and guidance. We had a good experience with the doctors at Apollo Cradle. They were supportive the entire time, and were always patient when it came to our doubts and concerns. Thanks to them and also to all the support staff at the centre. My overall experience with the hospital was good. I\’ve known Dr. Teena for several years now and was really confident with her for my major surgical procedure. As was expected, all went well. My sincere thanks to all the paediatricians, lactation specialists, physiotherapists, diet consultants who helped me cross this difficult phase with ease. The services from nursing staff were exceptionally good, and the front desk staff was extremely supportive too. Thanks for all the lovely gifts and the wonderful cake too! Our doctor, Dr. Teena was excellent, and we were very comfortable having her as our doctor. The front desk staff is very efficient and we\’re thaknful that they made our life easy. The nurses are also very good, thanks to all of them for taking such good care of us. Consulting Dr. Teena Thomas@ Cradle Brooke fields, Over all satisfied with the experience, Looking forward delivering at the same facility. 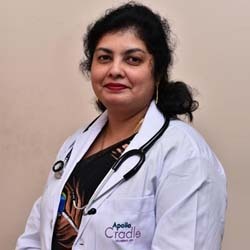 Consulting Dr. Teena Thomas at Cradle Kundahalli – good experience till now Planning to deliver here over all service offering is excellent. We chose Apollo Cradle given its reputation and proximity to our home. It was a right choice. Our best wishes to you and thanks for your attention and hospitality during our stay. Thanks to you.